About – FruitFlyFunnel™ – Say Bye-Bye Fruit Fly with the washable reusable trap for fruit flies that’s environmentally friendly! The Fruit Fly Funnel is a reusable solution designed to turn most plastic soda or water bottles into a simple, small and effective fruit fly trap. The bait can be made with common ingredients found at your local grocery store and can be taken to different locations or be shipped anywhere on the planet. 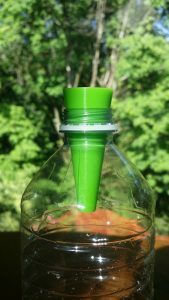 Stop throwing out one time use traps – start being environmentally friendly and save time & money by ordering your Fruit Fly Funnel solution today.